Ryu Kihyun’s unused concept art for a young Lion-O and Tigra. There are any number of reasons as to why fans of the original ThunderCats series from the ‘80s are up in arms over the style of ThunderCats Roar, Cartoon Network’s upcoming reboot of the franchise that’s decidedly more whimsical and aimed at a younger audience. That being said, ThunderCats Roar isn’t the first time Lion-O and his friends have been rebooted. In 2011, Cartoon Network brought the ThunderCats back with a new series developed by Ethan Spaulding and Michael Jelenic that was deeply influenced by Japanese animation. 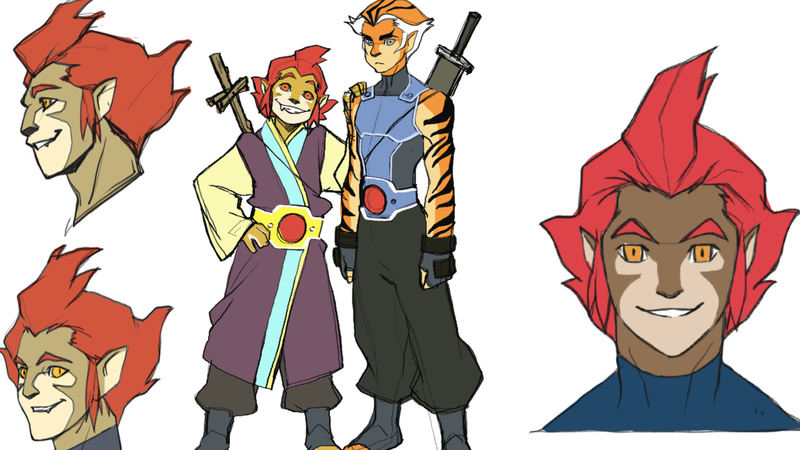 Sadly, the new ThunderCats was canceled after a single season, but with ThunderCats Roar getting everyone interested in the anthropomorphic cat people again, concept art from the 2011 show has come back into the spotlight in a big way. As part of ThunderCats’ preproduction in 2009, The Legend of Korra’s supervising producer Ryu Kihyun submitted a number of concept designs for the show’s core cast and they’re all downright gorgeous. There’s an argument to be made that some fans’ frustration with the upcoming series comes from the fact that Voltron, another ‘80s mainstay, was recently rebooted with an updated story that, while different than the original, is still very much a show that looks and feels like the thing they loved. Kihyun’s style cleaves much more closely to the original ThunderCats, and while his designs were ultimately rejected, one can easily imagine that this is the sort of thing that the people down on ThunderCats Roar were hoping for. Ryu Kihyun’s unused concept art for Lion-O. Ryu Kihyun’s unused concept art for Panthro. Ryu Kihyun’s unused concept art for Cheetara. Ryu Kihyun’s unused concept art for Wilykit and Wilykat. Reboots come and reboots go. ThunderCats Roar might not look like the series that certain fans want, but it’s the series they’re getting—and that’s extremely fine because the existence of a new incarnation of something does not mean the old versions are in danger. If anything, art like Kihyun’s is a testament to the idea that a fan’s passion for something they love means that that thing can and will continue to exist, so long as they’re willing to keep it alive in their own hearts. So just enjoy the new series (or, hey, don’t), and if you really need to feast your eyes on ThunderCats art that isn’t cute and bubbly, then just go back and watch the old cartoon or draw some yourself.